Nicaraguan painter Javier Valle Pérez lives and works in the capital city Managua, and his paintings are informed by the city’s energy and ambiance, as well as recent political and social turmoil. His visual narrative blends a childlike style of rendering with intriguing combinations of brilliant color and interacting forms. The realities of personal experience merge with his dreams of the future. In “Ciudad del Futuro” Pérez populates the canvas with figures, machines and imaginary architecture. Using a rich palette dominated by reds, blues and purples, he utilizes a grid that suggests a city map. His images are composed in vertical blocks, evoking a tapestry-like vision of a city both real and envisioned. “Batalla Cosmica” is filled with restless amorphic forms and militaristic conveyances. Perez produces a series of visual frames within frames where interacting groups of colorful shapes and figures float above dreamscapes. 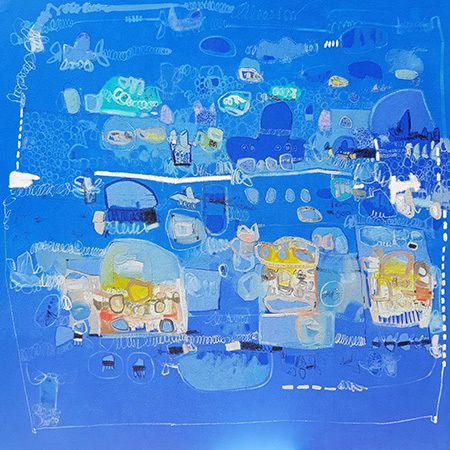 The large scale “La Pipilacha Azul” is dominated by blue, as the title suggests, as well as yellow floating elements. “Memorias de Guerra” has a more somber range of color and tone as the subject would imply. These worlds of fantastic machines, urban energy and imagined shapes are painted with bold colors, and their inhabitants are allowed to float and interact free of the restraints of gravity. The uncertainties and memories of Pérez’s personal experiences are never far away, but he chooses to express his visual stories with vibrant color and a joyful vision.